Delta flight attendant Kristen Diloreto, pictured at right, recently won $1 million playing the Georgia Lottery instant game Georgia's $500 Million Club. Ms. Diloreto purchased her winning ticket at a Publix supermarket in the town where she lives. According to a Georgia Lottery news release, Ms. Diloreto purchased the ticket while grocery shopping at the store. She scratched the ticket to reveal the winning number while still in her car. "I was thrilled," she said. "I took the ticket back to the store manager, and we both looked at each other in disbelief." The 40 year old flight attendant and her husband have three children. She said that she and her husband may use a bit of the winnings to take a family vacation. Beyond that, they have no immediate plans for their million dollar prize. 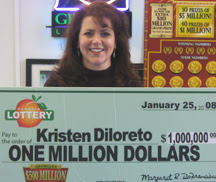 Congratulations to Kristen Diloreto on her good fortune!